I wish I could think of a better title for this than "Making a Magic Potion", since there's blessedly little potion swilling in "Call of Cthulhu". 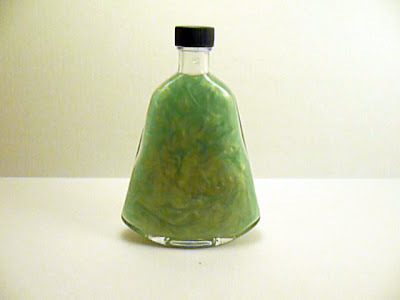 Putting that aside, this is a quick and easy technique for creating a swirling, iridescent liquid that looks great as a potion, bound spirit, or fuel inside the reaction chamber of some infernal mechanism. Just shaking the bottle produces a wonderful pearlescent turbulence, and the effect is considerably enhanced if you can illuminate the liquid. You'll need a bottle or container of some kind, regular kitchen food coloring, water, and the magic ingredient- mica powder. Have you ever seen an iridescent paint job on a car? Where the color shifts as it drives past you? That's the same effect produced by mica powder. For this project I'm using "Pearl Ex Powdered Pigment", a very fine grained mica powder available at your local craft store. A single small jar runs $3-$4, but you can pick up a twelve pack for around $1 a jar if you take advantage of the ubiquitous 40% off coupons offered by craft retailers. If you don't happen to have a craft store nearby you can order the powders through Amazon. You'll only need a small amount, so a single jar should be good for a number of bottles. 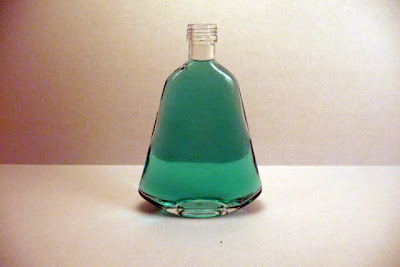 Fill your bottle with water and add a few drops of food coloring. 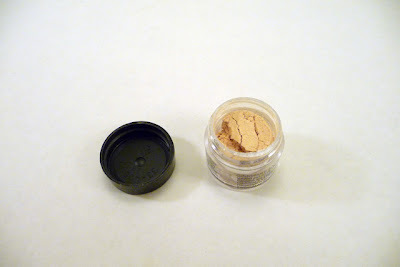 You won't need much, since the mica powder will add more color to the liquid. Then use a coffee stirrer or straw to scoop up a small amount of the powder and dump it into the bottle. Put on the cap, either a screw top or cork depending on what kind of container you're using, and give it a shake. Tada! You're done. Turbulence in the water causes the mica fragments to swirl around. As they spin light is reflected from the short and long faces of the particles, producing two bands of color as the phase of the wavelength is alternately reinforced and damped. 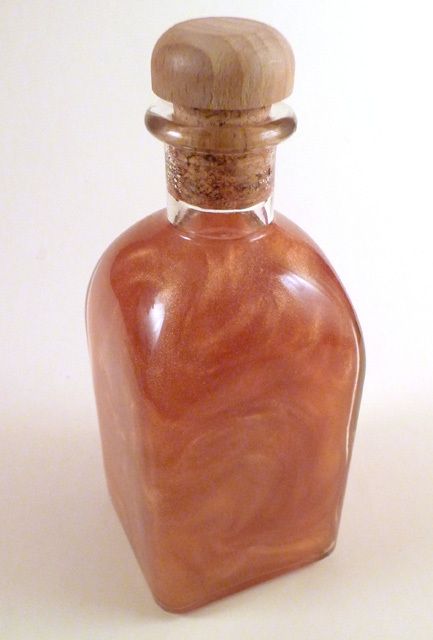 Here's a bottle without any food coloring, just mica. The red and gold coloring is produced solely by light reflected from the powdered pigment. Sadly, the iridescence will slowly disappear as the mica particles settle to the bottom of the container under the pull of gravity. You can delay that by using a more viscous fluid like glycerin or mineral oil instead of water, or by providing an outside source of energy. Ideally, you could mimic the technique used in some novelty lights with a glass container filled with mica impregnated fluid suspended over an incandescent lamp. The direct illumination will produce a more intense swirling effect because more light is being reflected, and the heat from the lamp will set up eddy currents that keep the particles suspended. My sensitivity to legal liability compels me to remind you that such a project could easily set your home on fire and cause a massive explosion if you're not careful, so use your head and assume I'm a bloodthirsty maniac hell-bent on leading you into misfortune. I've got about six "creatures in bottles" on my shelf from a late night last year that utilize this exact trick. 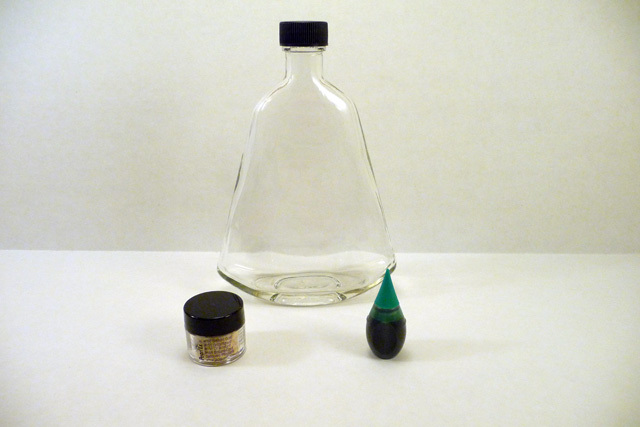 The mica fleck will eventually stick to the interior of the glass bottle or settle to the bottom of the glass; nothing a good shaking doesn't fix. Make sure your water is filtered, not tap, or you'll end up with weird scum (I live in New York, maybe this isn't a problem everywhere). ...and I like the new color theme; very classy. Mica Powder? Literally slapped my forehead having never thought of this before. Great easy quick tip with a good payoff. Thanks for sharing. I need find this Mica Pownder her in Brazil! I've been searching a tuto for that for a while now ! I have been making a very similar effect that uses a couple of drops of silver paint instead of mica powder. The paint is Folk Art brand Metallic Silver Sterling, and you can find it pretty much everywhere in the US. You will also notice it settling a little at the bottom but just give it a shake and it'll swirl again. Although it doesn't have the almost colour-changing effect that the mica powder does when it settles and gets shaken up.